StarMark's Treat Dispensing TetraFlex will keep your dog busy and entertained while enjoying their favourite treats or food. The single dispenser hole contains a one-way sleeve to make filling the TetraFlex easy, but getting the treats out creates a whole new challenge for your best friend. The treat dispensing system encourages your dog to engage in solitary fun play while enjoying their favourite treats, which helps to reduce anxiety and negative boredom behaviors. Why not turn mealtime into funtime with the TetraFlex and make him work for his food. Especially if your dog gulps down his food. The TetraFlex will force him to slow down. Made from uniquely soft yet durable material, the TetraFlex is tear resistant, whilst being gentle to the pet's teeth and gums. The TetraFlex material is also non-toxic, making it even safer as a home alone boredom buster. 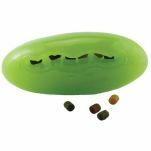 The deep pits that make up the surface of the TetraFlex is ideal for stimulating gums as your dog chews to get to the food inside. Like most StarMark products, the Tetraflex is easy to clean, as it is dishwasher safe. TIP: Use a cut plastic water bottle to funnel in the treats or food. As with all chewing toys, no toy is completely indestructible. 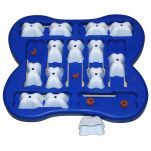 Please inspect the condition of the toy regularly and remove any small pieces that may present a choking hazard. My Girl loves this ball. The large is a good size for larger dogs.. my girl is only 13kg so i probably should of got the smaller ball.. However it's big enough for her to pick up and carry around which she likes. The rubber is soft but durable so will not damage the walls or floor. The treats can be a little difficult to get out and Lola does get cranky with LOL.. the trick is to use smaller treats. This was actually an impulse buy on my part but has become one of our dogs favourite toys. As we both work full time, we need to ensure our dog has enough stimulation and enrichment and this ball is ideal. Because of the material she can have it inside or outside the house and because it's hard-wearing, she can play with it every day. 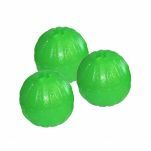 Read 7 customer reviews of StarMark Treat Dispensing TetraFlex Ball. The average customer rating is 4.9. This ball is fantastic! We have three other brands of balls that perform the same function - but they are made from harder materials that are *very* loud on the floorboards. The StarMark ball is sooo wonderfully quiet as it rolls around, gets dropped or thrown. I wish we'd had this one all along! We have two dogs, one 4 month old Pharaoh Hound x and one nearly 3 year old Staffy X Sharpei and they both love it. They can pick it up with ease and relocate it to a better rolling area if it escapes them, it doesn't roll too quickly with gentle nudges so they can follow along behind it at a reasonable truffling pace :DIt's been left out in the sun, the rain, lost for a few days in tall grasses, chewed on but you can't tell! They don't get frustrated with it enough to want to be destructive with it either! One small drawback is if you're using smallish treats, sometimes the luck of the ball distributes a handful at once (they don't mind XD) so it can run out sooner than desired.Love this ball, highly recommended for indoors and outdoors, really durable and easy to clean. All in All a great ball and Has got My Lola's seal of approval. Fantastic toy for my four month old Koolie, keeping him both entertained for a fairly long time and also slowing down his eating speed. My German Shepherd has the large size of this ball, and I can't recommend it enough. It's softer than other treat balls we've tried, so doesn't noisily crash into walls or make a racket on the wood floors. She can get just enough purchase on the ball to be able to throw it up in the air, which helps keep her interested. 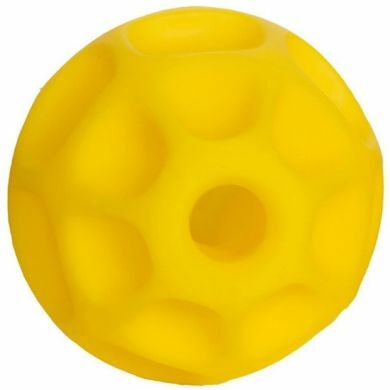 It also has a small hole on the opposite side of the main exit hole, so your dog isn't at risk of getting their tongue suctioned into the ball. It's definitely our favourite treat dispensing toy, and we've tried a lot! My Labrador retriever loves rolling this ball around till his treats drop out. Very well made.